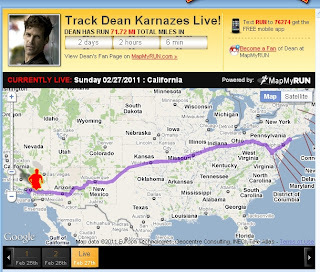 This is going to be a tough one for me to post, but I think Dean Karnazes (Ultra Runner) missed something when he planned his running route across the United States to "Inspire a Nation". 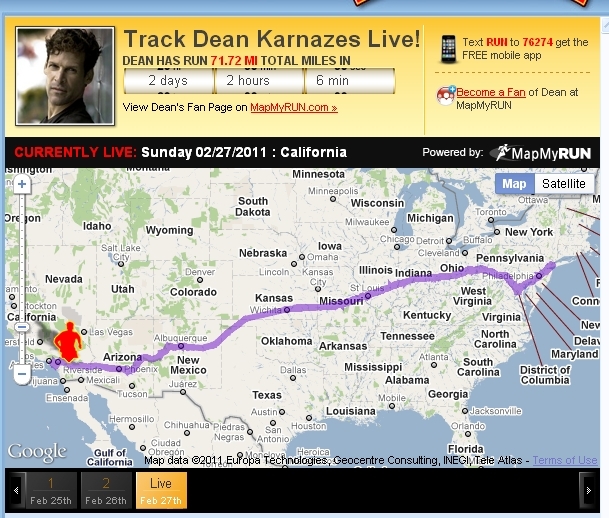 Most people who read a lot about running either love him or hate him, I happen to be a huge fan of Dean Karnazes. I read his first book, "Ultramarathon Man", and I am currently reading his second book, "50/50". In fact, I have been reading 50/50 to my son at night when he goes to bed (what can I say, he loves running stuff as much as me). Anyway, Dean teamed up with Live! with Regis and Kelly to run across the United States in a campaign against childhood obesity. He started February 25, 2012 and ran about two marathons a day until he reaches New York, NY. I love that Dean is able to use his superhuman abilities to raise awareness for something so important, but I have to wonder who planned his running route. When I heard about his plan I was so excited. I even thought I would try to go out and see him on one of his runs. You can imagine my disappointment when I saw that he would not be coming through South Carolina (ranked in the top four states for childhood obesity). As I looked at the map I realized that not only was he not coming through South Carolina, he was completely bypassing the South! 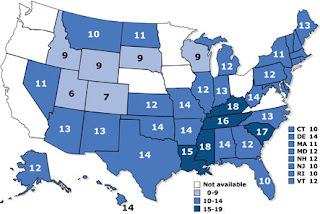 I pulled up the CDC Overweight and Obesity Trends and compared the two maps. You can see that Dean comes close to Kentucky and West Virginia, but never reaches any of the states that have the worst statistics of obesity.